The idea here is to examine when these games changed. Both home teams lead at halftime, and both were shut out in the 2nd half at the hands of a Harbaugh. For the Patriots, it was the moment pictured above, right before halftime. The Pats led the Ravens 10-7, and their defense was playing very well. Tom Brady was running the 2-minute drill as efficiently as you'd expect. With 26 seconds left, the ball on the 10, and 1 timeout remaining, Brady was forced to scramble and it appeared he had some room, but the gap was closed quickly by Ed Reed, which sent Brady into a slide at the 7-yard line. It's hard to imagine what's going through everyone's mind at that second, because it's generally kind of a routine play. But Brady saw Reed coming late, and anticipated that he likely wouldn't just let him slide without getting a shot in - even if it's illegal. Reed has a bit of a reputation for making his presence felt (or as they used to call it a couple of decades ago "football"). 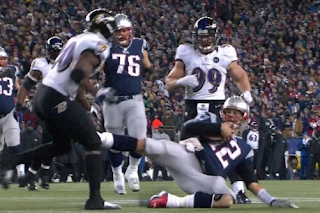 So Brady went "spikes up" a la Ty Cobb, and karate-kicked Reed in the thigh. It was a dirty play, but also a statement-maker against one of the most feared defensive players in the game who could have easily launched into a half-the-distance personal foul. The problem is it turned Brady from his usual self, a precise automaton into a emotional fighter, and couldn't get his team rallied to the line of scrimmage before having to burn the last timeout with 5 seconds left. They settled for a FG and a 13-7 lead. They brought the game to a heightened level of intensity, something the Bellichick/Brady conservative gameplan wasn't tailored to fit. Checking off to between the tackle runs at the line of scrimmage, and punting from the opponents' 35 (twice) might have worked if the Pats could match the Ravens physicality. That's where they came up short. Bernard Pollard knocked Stevan Ridley into next season with a vicious shot that caused him to cough up the football. And Anquan Boldin took (and I mean took) 2 TD passes from Flacco, swatting away Patriots defenders like insects. The Ravens owned the 2nd half after the Patriots gave away points, momentum, and the emotional edge right before halftime. The Ravens wanted it more. In the Falcons' case, I'm not certain the right team won. It came down to the last minute but it was a wild series of events that led to it. 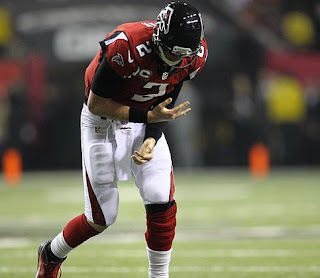 There were three egregious errors from Matt Ryan in the 2nd half: the pick and the flubbed shotgun snap he took his eyes off in Niners territory, and the timeout he burned early in the 3rd Quarter. But he was mostly magnificent, and one of the mistakes was nullified when Michael Crabtree got stripped on the shadow of the goal line. Ryan took the Birds methodically down the field for the possible winning score. The drive started with 8:23 and they were in a great position to score and left SF very little time. But on 2nd and 9 at the 14, Ryan was flattened after completing a dump-off pass to Jason Snelling and was obviously in tremendous pain. We know now he sprained the AC joint in his non-throwing shoulder. If this were the regular season he'd be out 2-4 weeks. Ryan gamely finished but was clearly in heavy pain. He had no zip on the ball on the 3rd and 4th down plays, and the one desperation pass once they got it back. It was this close to being a different history. But that's what Falcons fans have come to know and live. History.